The Lyndon B. Johnson Museum of San Marcos and the Texas State University Political Science Department will celebrate the 50th anniversary of the signing of the Voting Rights Act at a special event Thursday, Aug 6 at 6:30 p.m. at the museum, 131 N. Guadalupe Street, San Marcos. The event is free and open to the public. During the reception starting at 6:30 p.m., the museum will show the video of President Johnson’s speech and the signing ceremony. Larry Temple, Chairman of the LBJ Foundation and once Special Counsel to President Johnson during his presidency, will be the guest speaker. Temple is a respected Austin attorney who has previously served as President of the LBJ Foundation. The foundation supports the LBJ Presidential Library and the LBJ School of Public Affairs at the University of Texas in Austin. Temple has dedicated much of his professional and personal life to education. With undergraduate and law degrees from The University of Texas, he was chair of the Texas Higher Education Coordinating Board, President of the Texas Exes, a member of The University of Texas Development Board, Centennial Commission, and the Commission of 125. 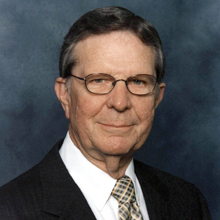 In 1990, The University of Texas System Board of Regents established the Larry Temple Scholarship Endowment awarding scholarships to students in the College of Liberal Arts. “The Voting Rights Act that President Johnson signed into law on Aug. 6, 1965 was landmark legislation that enfranchised black Americans and other minorities and changed the landscape of political leadership at every level of government,” said Dr. Ed Mihalkanin, President of the Board of the LBJ Museum of San Marcos. The Voting Rights Act outlawed literacy tests and poll taxes that for decades had posed formidable barriers for citizens to register to vote. The Voting Rights Act, along with the Civil Rights Act of 1964, were hallmarks of President Johnson’s history-making legislation during his presidency. The LBJ Museum of San Marcos is dedicated to commemorating LBJ’s formative years as a student at Southwest Texas State Teachers College (now Texas State University) from 1927-1930. Much of his later legislation was inspired by his early political experiences in San Marcos and his years as a teacher of minority students in South Texas. Following Temple’s remarks, the museum will have an early celebration of LBJ’s 107th birthday (on Aug. 27) with cake and punch. The LBJ Museum is free and open to the public Thursdays-Saturdays from 10 a.m. to 5 p.m. Those wanting group tours on other days may contact Rafael Garcia, Museum Manager, at 512.353.3300 or email director@lbjmuseum.com.